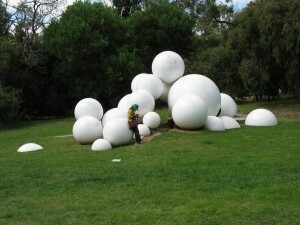 I had a wonderful afternoon exploring the McLelland sculpture garden near Melbourne. 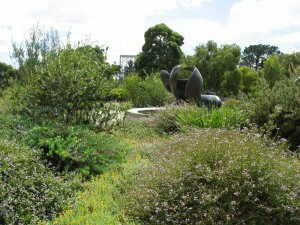 This is set in grounds which include a lake, lawns and areas of mostly virgin ‘bush’. The photos here show how the sculptures fit in to their various habitats. Coming into the garden you first see lawns round a lake, with a gallery building. 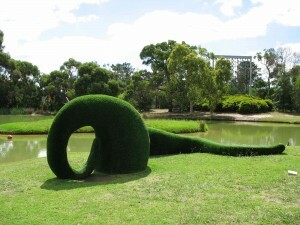 By the lake is an artificial hedge sculpture laying along the lake edge, its green contrasting with that of the lawn. 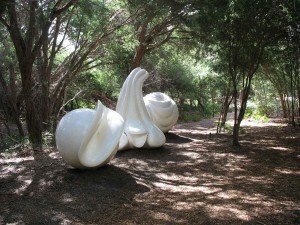 Near the gallery there is a Mediterranean bed with a curvy sculpture.. ..Which as you get closer you realise is of dolphins – I loved this. 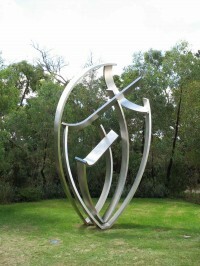 Sculptures look different against landscape, ground and sky. 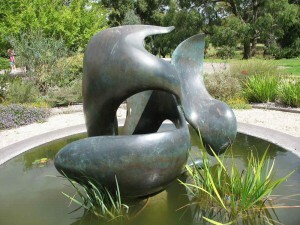 This curved sculpture is a good example. 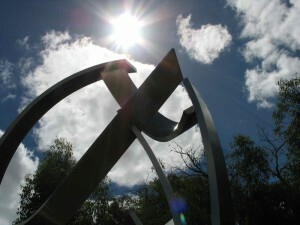 And here it is against the sky – very impressive. 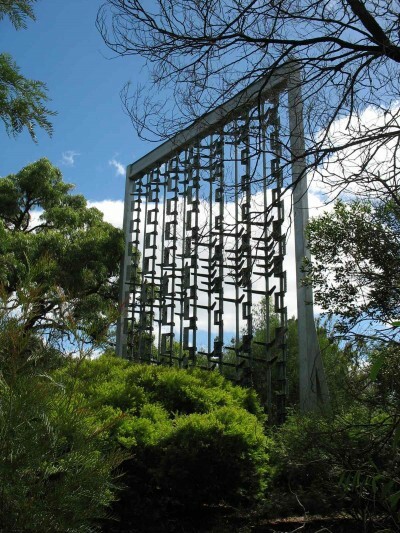 Here are two examples of sculpture located in low-growing bush. The first is called ‘Strange Fruit’ I think, and reminds me of Anish Kapoor’s early works, only in shiny white, or like excretae from a strange and wondrous animal. 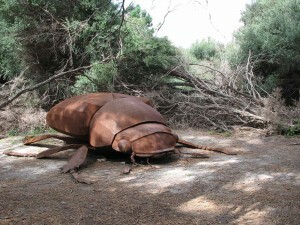 The second seems to blend into the bushland as though the trees and bushes were twigs around this beetle. 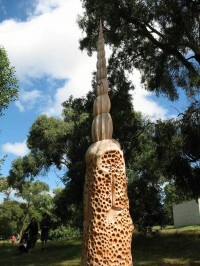 There was so much, in so many styles – here is my favourite, in wood, inspired by a termite mound. 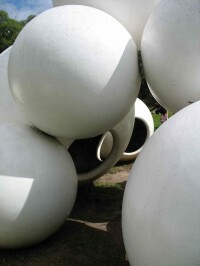 Lastly a popular and pretty children’s playground sculpture – the balls are hollow, can be accessed and are great for making echoes!